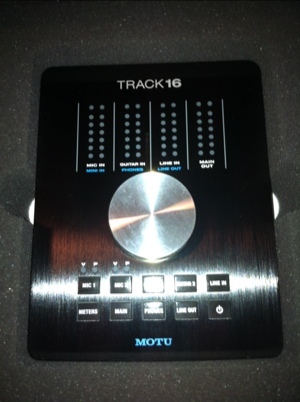 I’ve been using the MOTU Track 16 for my live mixer on shows in CA and its been fantastic with CueMixFx. On my trip out to CA this Aug I decided to try something new and very light. I used the MOTU Track 16 with there built in CUEMixFX for eq and reverb. I start with the DPA 4099G mic. 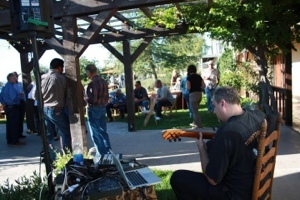 Then I have been also using the RMC Pickups to a Roland GI 20 interface to convert to midi, then into Pro Tools 9 on a Mac Book Pro and in Pro Tools I use Omnishphier, and Stylus RMX as well as Machine. This then gets mixed and out to a QSC K8 or Beringer 10in speaker, I use the headphones out as my monitor send and and in ear headphones so I don’t have a need for monitors. Its been sounding great and I like that I can travel and take the whole system with me when I fly. 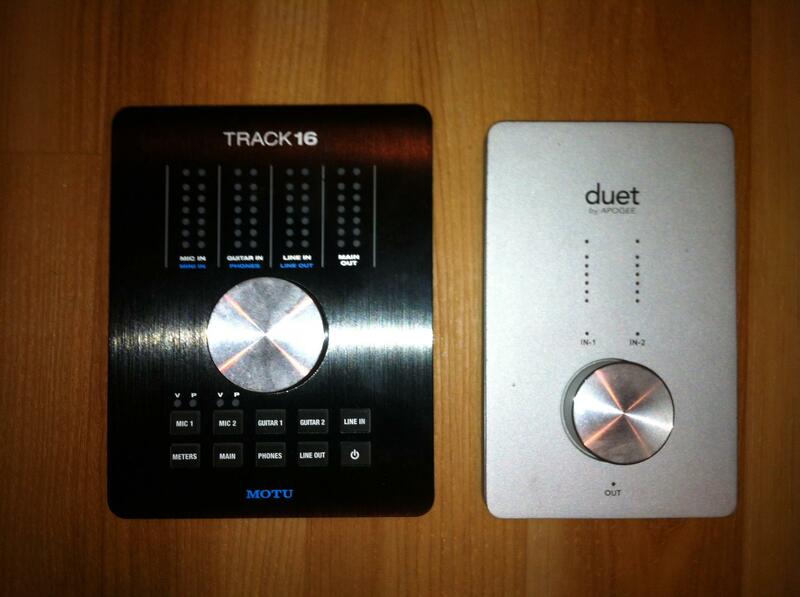 I was with my friend Taz today and took a picture of the Motu Track 16 and Apogee Duet (1st Generation) today so you can see the size diffrence. 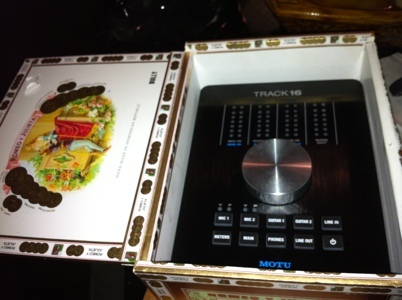 Taz thought that the Motu Track 16 was on par with the Apogee Ensemble. 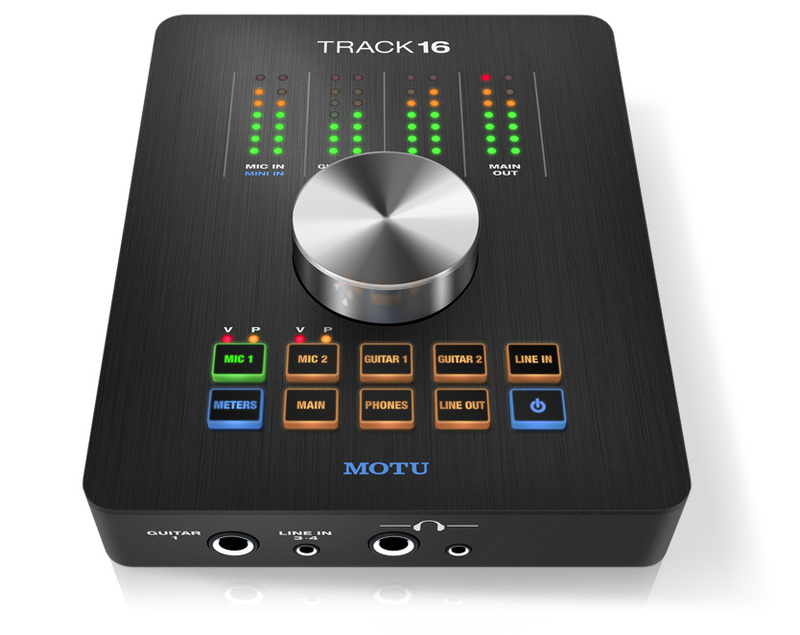 I love the MOTU Track 16 the below first file is with the Track 16 into my MBP (Mac Book Pro) running OS 10.7.4 to Pro Tools 9.0.6 and I used the API plugins from Waves. Mic used was the DPA 4099. The one thing that I did do was a fresh restart and power up on the Track 16 and now there’s no hiss or noise in any of the signals. The second track is with my (MP) Mac Pro OS 10.6.7 and Pro Tools 9.0.6 running on fire wire. The Motu Cue Mix sounds great too and I will be using it when I head out to CA later in the month to use as my live set up. Im going to try using the MIDI in line with my Roland GI-20 Interface to use to trigger synth sounds such as Spectrasonics Omnisphere. After a week of use. 8.7.12 I have to say this really is one great pice of gear. 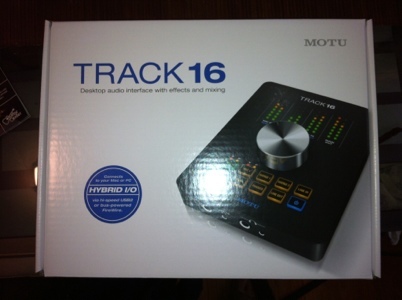 I have been using the MOTU Track 16 with Cue Mix and for Live its awesome. I have in mic channel one my DPA 4099 G mic and in Chanel 2 from the RMC Pickups and Poly-Drive II to the Fishman Aura Spectrum DI then in to the input for ZERO (0) Latency with EQ and Reverb, Then I run Pro Tools 9.0.6 and use Omnisphere and Stylus RMX and run them thorough the MOTU Track 16 and out to my main monitors for an amazingly great live sounding set up. Sounds excellent! I would not have guessed that is was recorded on such a small device. The folks at Sweetwater were great in helping me get the MOTU Track 16 Mark Magdich 1800-222-4700×1265 and the flex pay makes it easier on the wallet. 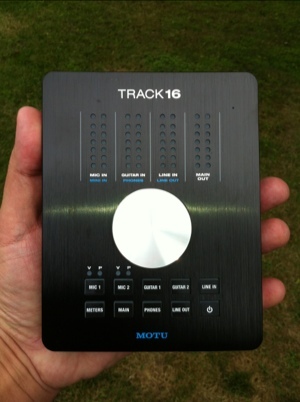 I received my MOTU Track 16 it looks nice. I am using it with my 2011 MBP (Mac Book Pro 13) and Mac Pro. I found the install to be a little tricky in that the cd did not have the drivers that were needed so the Track 16 would be recognized. 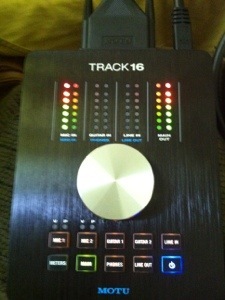 After about 10 min I was able to get the MBP to recognize the Track 16. I found that using Fire wire to hook up the Track 16 works on both computers but while using buss power on MBP it seems that the mic and line in are a bit nosey, may be the drivers I have a tech support question in the cue. I am waiting a bit before I conclude my opinion. Check back later. 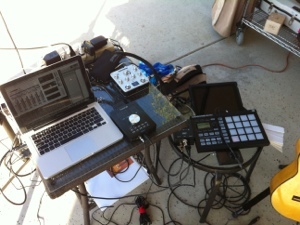 Ive been recently streamling my live set up. 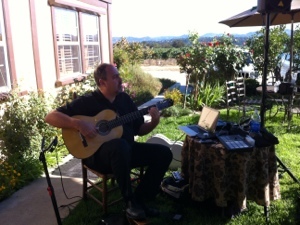 Im using the Fishman SA 220 amp, with my DeVoe Blanca that has the RMC Pickups with a Ploly Drive II preamp (off board not on the guitar) I was using the Fishman Aura Spectrum DI but this weekend I tried using just the Poly-Drive and the DPA 4099g mic and really liked the sound. I will be using the MOTU Track 16 as my mixer with the Waves API plug ins and run that to the Fishman SA 220. The RMC Ploly Drive will conect to a Roland GI-20 gutiar midi interface that will Triger Spectrasonics Omnispher running on a Mac Book Pro using Apple’s Main Stage.